No, it’s not some sort of hilarious April Fool’s Day prank. 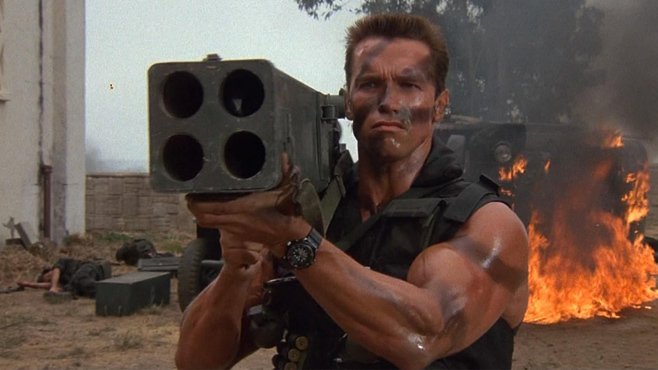 Like the minimally successful Nic Cage Month and Jaws in July from last year, I’ve decided that this April is a month primed to celebrate the greatest action star of all time: Arnold Schwarzenegger. And I almost spelled that correctly on the first try. What does this mean? I have no idea. All I know is I just watched a couple classic Arnold movies in the past week and plan on getting in some more. Not to mention that I’m completely on board with his upcoming zombie movie, Maggie. Maybe there will be some 5 For Fridays of pure Arnold. Maybe there won’t be. I can do whatever I want. Cool! He’s such an icon. My favourites; Terminator/T2, Total Recall, Predator, Commando, True Lies. T2 is the perfect sci-fi action flick for me. And I used to watch Total Recall all the time when I was probably too young to watch it.